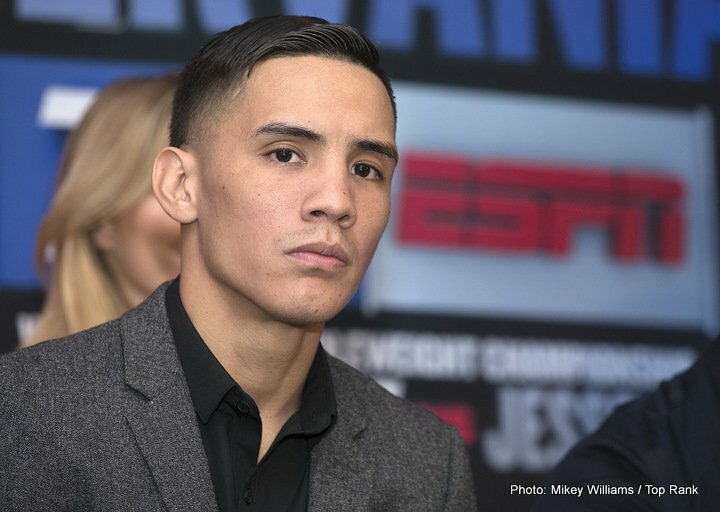 Eddie Hearn is looking to finalize a deal for a fight between Scott Quigg and WBO featherweight champion Oscar Valdez for March 10 at the StubHub Center in Carson, California. The fight will be shown on ESPN. The fight could be announced very soon. #10 WBO Quigg (34-1-2, 25 Kos) is very intrigued by the fight. He has a real chance of beating the 27-year-old Valdez to become a 2-weight world champion. Quigg lost his WBA super bantamweight title to Carl Frampton by a 12 round split decision in February 2016. Quigg moved up to featherweight after that loss, and he’s looked a lot better. Hopefully, Valdez’s promoters at Top Rank don’t change their minds about wanting to make the Valdez-Quigg fight. This would be a much tougher type of fight for Valdez than any of his previous matches since he turned pro in 2012. Valdez has starting to look a little human in his last 2 fights against Genesis Servania and Miguel Marriaga. Both guys hurt Valdez. Servania had Valdez down on the canvas in the 4th round. ”He’s been working quietly over the last 12 months and so have we. Now he’s ready to tear open the division,” said Hearn. Valdez, a 2008 Olympian, won the WBO featherweight title in stopping Matias Carlos Adrian Rueda in the 2nd round on July 23, 2016. Valdez has since defended the WBO belt 3 times in defeating Genesis Servania, Miguel Marriaga and Hiroshige Osawa. Quigg and Valdez sparred with each other a couple of years ago. Valdez obviously feels comfortable with Quigg enough to want to fight him. Quigg is trained by legendary trainer Freddie Roach in Los Angeles, California. Quigg has impressed since his loss to Frampton. He’s won his last 3 bouts in defeating Oleg Yefimovych, Jose Cayetano and Viorel Simion. Quigg is looking very good right now and hard to beat. You’d have to consider him a favorite against Valdez, who might be starting to show signs of wear and tear from his brawling fighting style. Valdez is one of those guys that slugs too much for his own good. The style that Valdez uses is not one that is conducive to long careers in boxing. We could be seeing that wheels beginning to fall off for him. Unless Valdez changes his fighting style, he could get knocked out by Quigg on March 10.